I’m proud of these boys. They fought hard. They never thought about quitting. They just thought about the next guy on the team and what they could do to help. Heck, half of them don’t even know their names but if you ask them to play their hearts out they’ll do it without a second thought. That guy over there would take a bullet for any of his teammates, but ask him a simple question?, well, you’ll find that he can only communicate with an intricate series of grunts. A language all his own. I love these guys. They never say die. They don’t know the meaning of quit. Several of them eat rocks almost daily because they don’t understand simple food consumption. But if I could coach anyone, I wouldn’t have it be anyone but them. With the game on the line, heck, I’m spoiled. I’ve got a few folks I wouldn’t hesitate to call on. This guy, to my right, he thinks that I’m his imaginary friend but talk about clutch. And to my left, this guy is all business, after I pick out his clothes for the day. I’m a proud coach. I’ve got a great team and we were this close to being champs. We’ll be back next year for another try at this thing. Now if you’ll excuse me I’ve got some hugs to give and diapers to change. 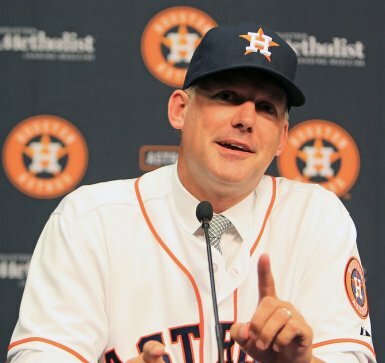 Welcome to Houston, coach. Houston, keep on keeping on it that ‘L’ column.